When I think back to our years sailing in Mexico and all its culinary delights, I recall with great emotion one thing: chili peppers. We spent one particularly glorious season in the Sea of Cortez, spearfishing every day for our dinner and enjoying a never-ending supply of three of my favorite things: cilantro, lime and chilis. All three go hand-in-hand, but cilantro and lime do not come in the varied and colorful forms that chilis do. And so it was with chilis that I experimented most. In particular, I fell in love with the mild poblano that season, using it in everything from savory scones to rice pilaf to garlic-citrus mayo on baked fish. Roasted, stuffed, or made into a quick salsa, the flavorful poblano became a staple item in my repertoire. And you just can’t live in Mexico without discovering the mysteries of mole, and you can’t have mole without the poblano. But other sorts of peppers also caught my fancy back then: chipotle turned my chili con carne deep and smoky, jalapeno became a standard in my spicy tomato-corn salsa, and serranos were a must in any respectable salsa verde poured over fish tacos. But back to peppers, and a particular story about the serrano. The serrano figured prominently in any salsas I made in Mexico; I like them spicy. Sometimes I’d use the serrano to heighten the flavor of my creamy cilantro sauce served over grilled chicken or fish. And I always used a serrano or jalapeno for ceviche, depending on which was available in my pepper basket on that particular day. Ceviche deserves a discussion of its own, for it is nothing short of a delight. It is pleasing to the eye and palate, nutritious, and easy to make with whatever assortment of fresh items you have on hand. It’s the perfect meal in the tropics, because you don’t have to crank up the stove or oven. We used whatever fish we caught: grouper, mahi mahi, trigger fish, snapper. 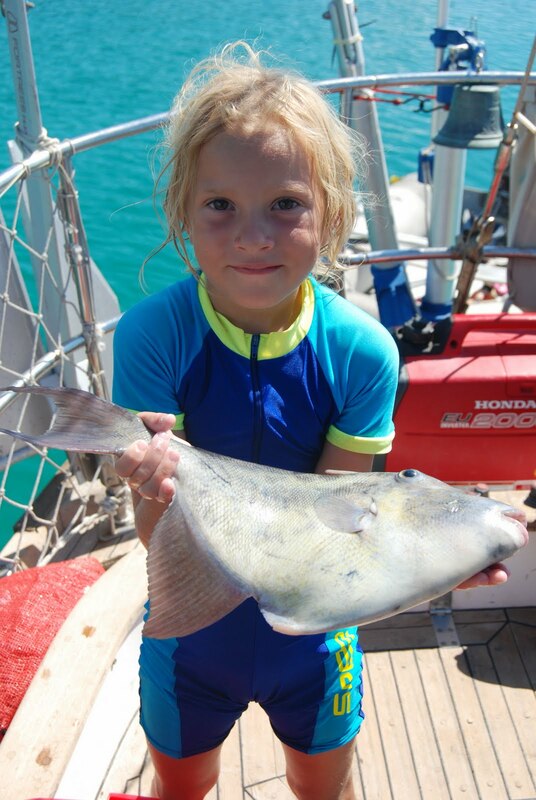 Even tuna will do (and is used in some South American cultures), but we prefer it with a firm white fish. Ceviche is made, quite simply, by marinating the fish in fresh lemon or lime juice -- which breaks down the proteins and pickles or “cooks” it without heat. Once you get your cubes of fish marinating, you start chopping veggies, and by the time you've finished chopping, you can break open the crackers or tostadas or forks and dig in. I make my ceviche with a few standard items: lime or lemon, onion, tomato, bell pepper, and fish. If I have avocado or orange, I might add it. Anything crispy will do as well: cucumber, celery, jicama. But mostly, ceviche just ain't ceviche without the right amount of kick. The serrano delivers. We ate our way through the Sea of Cortez that season nourished some days wholly on ceviche. I linger over my memories of those meals – fresh, colorful, crispy goodness. But let me offer a word of warning here, too. 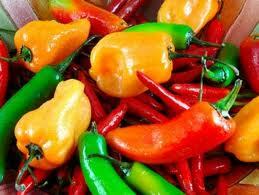 Serranos are actually quite hot. You’ve heard the stories of people rubbing their eyes after chopping jalapenos? Well, serranos are even hotter than that. And I had a very close encounter with a serrano one day. I know what you’re thinking; using the Scoville scale, the serrano looks mild. You’re thinking that a rub with a serrano might not be such a big deal. And I agree, to some extent: while I would have preferred an intimate brush with a poblano, I am forever grateful that I was not chopping habaneros that day. But the serrano is sharp enough, and the effect is immediate. I felt the full power of those 30,000 Scoville units that day: they burned into my skin, and into my memory. Do not ever, ever chop chili peppers and then change your tampon. You do not know the meaning of HOT until you’ve done this. And I don’t mean HOT in a titillating manner. I mean HOT as in panic-producing, sweat-inducing, scream-generating spiciness. Forget that itchy-hot sensation you get when you you've just chopped chilis and you inadvertently scratch your nose. This ignites a sensation on a whole different scale. Unexpectedly intense heat of that sort in the nether-regions is, quite frankly, shocking. And embarrassing (especially if your mother-in-law is visiting). After about an hour of rolling, clutching and hopping (one's urge to blow is just not possible in this case), things settled down. Copious amounts of aloe gel and a couple cold beers later, we were all laughing and eating ceviche. You might think I had no appetite after the Great Serrano Incident, but I do not believe in holding grudges against something so lovely as the serrano, and even though the pain still lingered, I appreciated the humorous side of the this particular fire in my loins. I still cook with chili peppers. 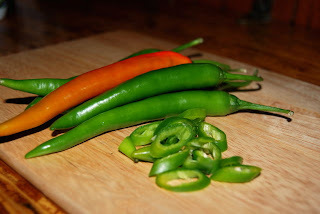 I chopped some jalapenos just the other day (and, no, I don't wear gloves, because I'm unteachable in that way). Burning fingers or no, I can’t help myself: despite my mishap with the serrano, I’m devoted to chilis. Some call it love; I call it burning love. A version of this article is out now in the August 2010 issue of Latitudes and Attitudes. Thanks to the Editors over there for putting my pepper story in the galley section of their magazine. A milk or yoghurt douche would have fixed you right up - od on a habanero - drink milk, being sure to swish all over the mouth. Cuts the effects faster than water, beer or juice. Hi Michelle! I am so inspired by your blog! My husband 2 toddler boys and I are planning on selling everything we have to live on a sailboat for at least a couple of years. We have so many questions about sailing with kids. We are very interested in building relationships with people who share this dream, so I am hoping you could find it in your schedule to chat from time to time with me via email?